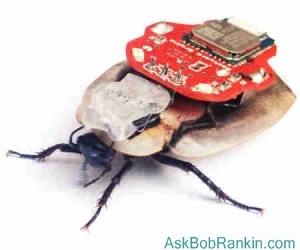 Why is the Rolls Royce company developing robotic cockroaches? Does Google Translate have a Doomsday prophecy component? Will Microsoft ever stop messing up our user interfaces? And do smartphone apps designed to improve your mental health actually drive you crazy? This issue is guaranteed to make you 146% smarter -- you'll see why. Read, think, and, comment! The first self-driving car was a 1986 Mercedes. It did over 130 kph on France’s Autobahn. Here is the story of its invention and how it came to be almost forgotten. Google Translate spews creepy apocalyptic messages if you do things like type “dog” 18 times and translate from Yoruba to English. Garbage in, garbage out. This just in from the "Don't Confuse Me With Facts" department: A was driver cited by a California Highway Patrol officer for going 99 in a 65 mph zone. The man argued that he wasn't going that fast, and tried to convince the officer that the readout on his radar screen was actually the current temperature. Windows 10 is now the first operating system in history to display leap seconds. Cisco has removed an undocumented admin password from one of its most popular bandwidth monitoring software, used by ISPs worldwide. The vulnerability went undetected for decades. Apps that claim to support your mental health may actually be driving you crazier. The FCC has opened its public comments period on the subject of whether to allow the proposed merger of T-mobile and Sprint; comments will be accepted through August 27, 2018. An app named DRUID helps you evaluate your degree of impairment before driving a vehicle. It does not measure blood levels of substances but your reaction times and other pertinent metrics. Google has been fined $5 billion (USD) by the European Union for unfair competitive practices that limit users’ choices of search engines. The issue arises from the fact that Google provides the Android operating system for free, and it powers 80% of all smartphones. However, Google has over $103bn in cash and plans to appeal. Rolls Royce plans to deploy robotic cockroaches to repair its airplane engines. Skype users are rebelling against Microsoft’s radical redesign of the app. Somehow this story sounds very familiar. Graphics cards prices are falling sharply as declining cryptocurrency prices reduce demand for the cards to be used as crypto-mining platforms. Facebook will deploy its first Low Earth Orbit satellite in 2019, beginning a network of satellites that will support broadband delivery without the latency of satellites in geostationary orbits. This just in from the "I Always Feel Like Somebody's Watching Me" department: A driver has been booted by Uber, Lyft, and his livestream platform after it was revealed he’d been livestreaming passengers without their permission. Microsoft discovered three Russian attempts to infiltrate U. S. political campaigns and helped the government foil them. The “MoneyTaker” hacker gang has stolen over $14 million from Russian banks. Here’s how they do it. Most recent comments on "Geekly Update - 25 July 2018"
The reasons for the EU fines against Google are very similar to the case the US DOJ brought against Microsoft in the 1990s. I wonder if the DOJ will hop on board to mess with Google. "Why is the Rolls Royce company developing robotic cockroaches?" You've heard of the Roach Motel? This is for the Rolls Roachmobile. It goes like crazy and multiplies autonomously. You should add buttons to your newsletters, so they can be shared easily on Twitter, G+, and FB. BobR (and PeteL) - Please *don't* "add buttons to to your newsletters, so they can be shared easily on Twitter, G+, and FB." Those buttons add tracker cookies to the web page to do just that. It doesn't matter if you don't click those buttons, but now Twitter, Google, and Facebook known where you're been and what you've seen. Unless blocked, they slow down the loading of the page. Don't fool with Microsoft. They've got you more confused than ever before in the security department, and I suspect, are all too often willing to help out the government peek here and there. I haven't experienced anything mentioned in the article, but the other day, I accidentally typed gibberish because one of my hands was shifted on the keyboard, and Google translated what I had INTENDED to type. Creepy or Cool? I can't decide.